While compliance is a daunting challenge given the numerous and expanding regulatory requirements, it also is an opportunity to establish and encourage operational excellence throughout the organization. Broadly understood, compliance is an important mechanism that supports effective governance. Compliance with regulatory requirements and the organization’s own policies is a critical component of effective risk management. Monitoring and maintaining compliance is one of the most important ways an organization maintains its ethical health, supports its long-term prosperity, and preserves and promotes its values. Doing so effectively and efficiently through a helpline/hotline capability (HHC) is one of the ways in which the governance, risk, compliance and ethics (GRC) capability can proactively contribute to the organization’s bottom line. An agile HHC can enable the organization to more effectively and efficiently prevent, detect, and respond to similar misfeasance and/or malfeasance in the future. Even if there were nothing to tell you that you must have a mechanism for raising inquiries about proper conduct and reporting suspected non-compliant or unethical behavior, the bottom line is that you already have some mechanism. The real question is do you want that mechanism to make it easier for people to raise issues with your organization directly so you have the first shot at investigating or do you want a mechanism that makes it easier for people to report to authorities first, leaving your organization in a reactive/defensive mode? You want the approach that is the least “costly” to your entity – both monetarily and reputationally. Given the number of countries that have either enacted enabling legislation to prevent global fraud and corruption, the number of countries that have enacted whistleblower protections (including helpline/hotline mandates), the countries whose governance laws require anonymous reporting mechanisms, and the countries who are issuing guidelines on helpline/hotline operations, it is highly unlikely that you are not subject to at least one mandate relative to helplines/hotlines. If a multi-jurisdictional law doesn’t apply to you, a national or even state/provincial law may be the source of your mandate. self-disclosure to appropriate authorities of investigation outcomes as mandated and as deemed otherwise desirable. 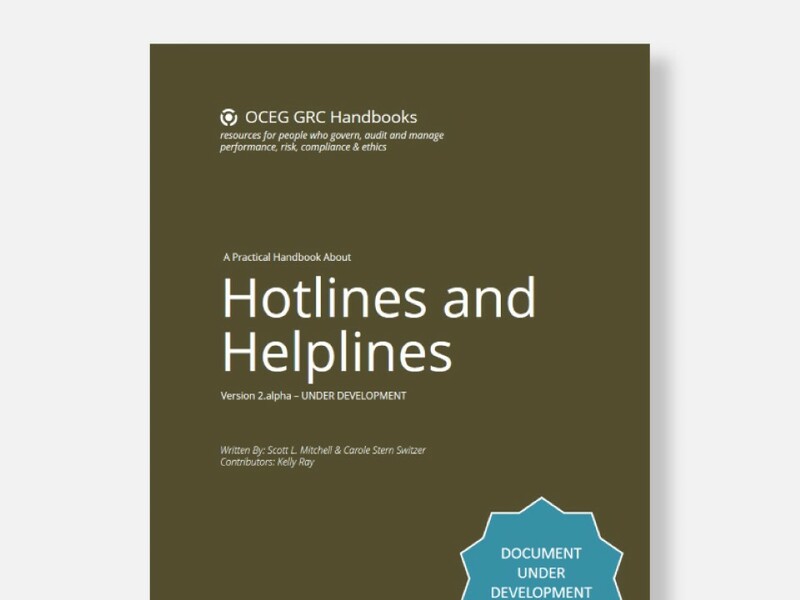 We have emailed instructions to access Handbook – Hotlines & Helplines to . Make sure the email arrives in your inbox: either add "support@oceg.org" as a safe sender to your email platform, or if you use Gmail, drag our email into your Primary tab.